Couples who are divorcing need to divide all their marital property and debts, assigning property, money, and debts to one spouse or another. All property, income, and debts acquired during the marriage are considered “marital”—it does not matter if one spouse made more money than the other or if the couple kept separate bank accounts and paid for expenses separately. Division of assets in Massachusetts must be “equitable”. This means they must be fair but do not have to be exactly equal. This can empower couples to divide their property in the ways that work best for them, as long as both spouses find the division to be fair. 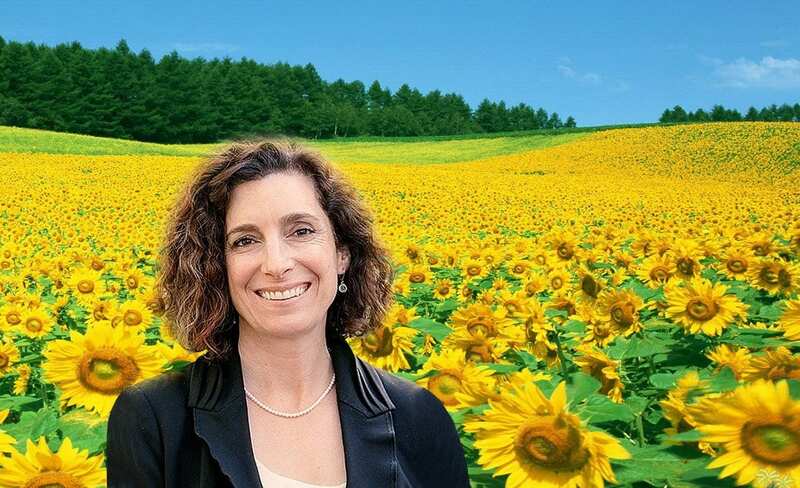 Through divorce mediation, uncontested divorce, and expert qdro drafting, Attorney Julia Rueschemeyer has helped nearly 1000 couples to customize their division of property in ways that the couple (and the judge signing the divorce decree) have found fair and equitable. Feel free to call or email Julia with any questions you have about division of marital assets when divorcing. By law, Massachusetts is not a “community property” state, but in practice, even after litigation, most property settlements end up very similar to what they would be in community property states. In community property states, premarital property is defined to be “separate property” belonging to one person, and all property accumulated during the marriage (with the possible exception of inheritances) is defined as “community property,” belonging equally to both spouses. In community property states, couples are obliged to follow an exact 50-50 split of community property. In Massachusetts law, by contrast, a judge can throw all property, both premarital and marital, into the mix, and the court does not have to divide it evenly. If a court, rather than the couple themselves, is deciding how to divide assets, Massachusetts law (Chapter 208, Section 34) specifies that “the court may assign to either husband or wife all or any part of the estate of the other.” In other words, the court can take all the property of one spouse, even premarital, and give 100% of it to the other spouse! Massachusetts law states that the court, when dividing property, “shall consider” 15 factors, including the length of the marriage, the age and health of the spouses, and past, current, and future income earning potential of each spouse. Unfortunately, the law does not specify how these factors should be weighed or what effect, if any, they should have on the eventual division of property. Given the glaring lack of practical guidelines in state law as to what “fair and equitable” might mean, it is not surprising that most couples and courts end up with divisions of property that are very similar to what they would be in community property states. Couples who are negotiating the terms of their separation agreement out of court, e.g., through mediation with Julia Rueschemeyer, do not have to try to base their agreement on these 15, poorly-explained factors. Couples can simply agree on a division of assets that they find fair. For many couples, this means taking a 50-50 division of property acquired during the marriage as a starting point. In divorce mediation, couples also have the power to determine how inheritances received by one person during marriage should be shared or divided. If inheritance funds are spent by the couple on a house in which the couple then lives for 15 years, the couple tend to treat that money as long-since shared. If a spouse in a 3 year marriage receives an inheritance one month before divorcing, the couple may be more likely to treat that money as belonging to just one spouse at the time of divorce. If you have children, you should note that changes in tax laws for 2018-2025 affect the ways that tax breaks are distributed or shared among divorcing spouses. If a couple chooses to aim for a 50-50 split of property, each piece of property can be assigned a value, so that the the total value of the property (and debts) taken by each spouse is approximately equal. Although one spouse might keep a house and all the credit card debt, and the other spouse might keep the retirement account and two cars, the value of the assets and debts that each spouse keeps can be adjusted and made equal in the separation agreement. 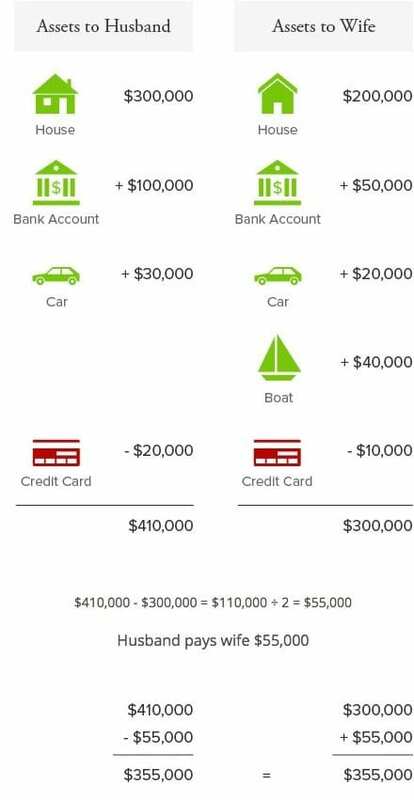 In the example graphic to the right, a couple has two houses, two cars, a boat, money in the bank, and some credit card debt. After property is put into the husband’s column and into the wife’s column in a first pass at dividing the property, it becomes clear that the value of the assets going to the husband is higher than the value of the property going to the wife: the property in his column is worth $410,000, while the property in her column is only $300,000. To equalize the value of the assets that each gets, the husband can pay the wife $55,000 from his bank account, so that each gets assets of $355,000. She gets $300,000+$55,000=$355,000, and he gets $410,000-$55,000=$355,000. You can experiment with dividing the value of your assets (and debts) in the calculating table below. You can use this interactive table to get a sense of how the value of your assets can be divided. The table has six columns, in which you 1) name the property or debt, 2) assign a fair market value to the property, 3) list any loan or debt associated with the property or debt, and, in the last two columns, assign the value of assets or debts to the “Husband Keeps” or “Wife Keeps” column. The total value that you enter in the the “Husband Keeps” and “Wife Keeps” in each row must equal the value in the “Equity” column for that row. When you press “Calculate”, the table will tell you what percent of the assets are assigned to each of the two spouses, and how much money the husband or wife would have to transfer to the other in order to achieve an equal division of assets. Wife needs to transfer $5500 to Husband in order to achieve an equal division of assets. 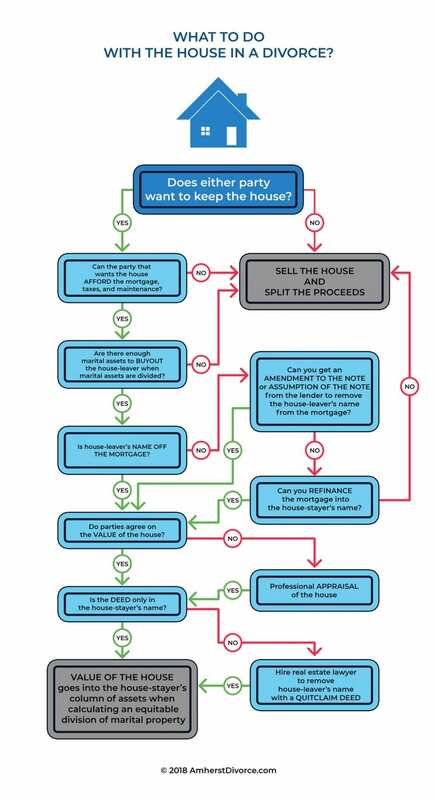 What should you do with the house when you divorce? 3) your spouse keeps the house. If one of you keeps the house, that person will need to “buy out” the other person. So if you have $100,000 equity in the house, the person who stays might compensate the other person $50,000, if you are aiming for a 50-50 split. This can come from savings, a retirement account, or other assets. Sometimes it is possible to refinance the mortgage and cash out enough money to compensate the person who gives up their share in the house. If you have a mortgage for the house in both spouses’ names, you will need to move the mortgage into the name of the person who is keeping this house. You can do this with a mortgage refinance, or, in some cases, the bank where you have your mortgage may allow you to make an “amendment to the note” or a “modification to the note” or an “assumption of the note.” If your mortgage bank allows you to do this, you keep the original terms of your loan and continue paying it as if nothing had changed except that the mortgage is now only in one name. This is less expensive and easier than refinancing and getting a whole new mortgage. If only one spouse’s name is on the mortgage or you have no mortgage, but both your names are on the title for the house, you can use a “quitclaim deed” to move a spouse’s name off of the title. A real estate attorney can do this for you. The infographic I created at left, represents the choices and outcomes that couples negotiate in regard to a marital home. How do we divide retirement accounts and pensions? Pensions and retirement accounts, along with a marital home, are often the highest value marital assets that a couple must divide. Therefore, it is important to understand the different types of retirement benefits and the options for dividing them. 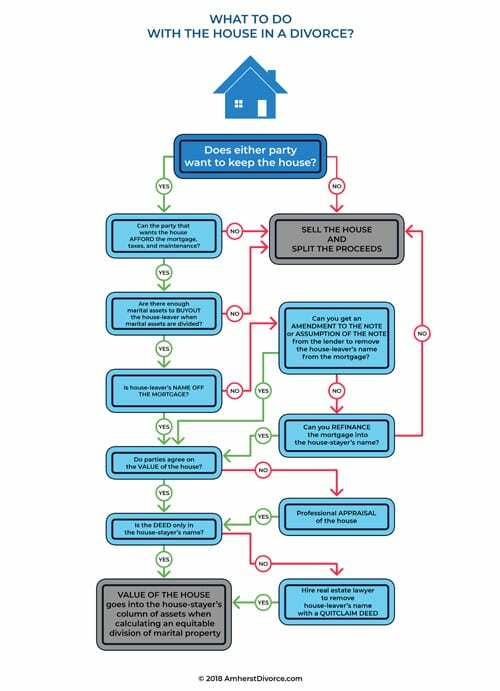 The infographic flowchart below illustrates the ways in which different types of retirement accounts are divided in divorce. Text below the infographic describes the different types of accounts and the steps involved in dividing them. 1)“Defined Contribution Plans” such as 401k’s, 403b’s, 457’s, federal TSP, and IRA’s are like savings accounts. Their value is simply the amount of money that is in the account at any given time. It is easy to determine their value when assets are divided by looking at an up-to-date statement of their balance. This value is often divided into pre-marital value—money accumulated in the account before marriage–and the marital value—the money accumulated in the account during marriage. The marital amount of the pension is then divided as part of the division of assets. To actually divide the retirement asset, you will need a “QDRO” (Qualified Domestic Relations Order). A QDRO is a court order, written by an attorney or accountant and signed by the judge, which instructs the 401k or retirement account administrator how to divide the assets. These are rolled over into a retirement account in the name of the spouse who is receiving them. Attorney Julia Rueschemeyer can prepare these QDRO documents for you. Dividing IRA’s does not require a QDRO (since one spouse can simply transfer retirement funds to the other spouse), but it does require special language in the separation agreement. Money saving tip: If you have an old 401K (or 403b or 457) from an employer where you don’t work anymore that you might want to divide in a divorce, you can do a “direct rollover” of that money into an IRA. Dividing an IRA does NOT require a QDRO. This could save you the cost of a QDRO ($300-$1000) and the drawn out process that QDRO’s often involve. 2) “Defined Benefit Plans” are often called pensions (or sometimes annuities) and are common among state employees and public school teachers. The value of these has almost nothing to do with the amount of money, or balance, they have in them, but rather is determined by a formula. The most common defined benefit plans in Massachusetts are the State Employee Retirement System (SERS) and the Massachusetts Teachers Retirement System (MTRS). In both of these plans, the amount of future pension payments is determined by a formula that includes the recipient’s age, number of years of service, and the average salary from the highest three consecutive years of earnings. Massachusetts state employees can calculate their estimated pension benefits with a calculator on the state site. Public school teachers can use the easy-to-use, online MTRS pension calculator on this site, or download a less convenient calculation sheet from the Massachusetts Teachers Retirement System to project their future benefits. Call or email Julia with questions about QDRO’s or division of marital property, including retirement assets. 1) In the “deferred distribution” method, a portion of each future monthly benefit is sent to the beneficiary, the spouse who was not the pension participant, once benefits begin (typically at retirement). With the “deferred distribution” method, in which future, monthly pension benefits will be shared, instructions to the pension administrator are given in a DRO (“Domestic Relations Order”), the type of order used to divide many government or public employee pensions. Like a QDRO, a DRO is a court order, written by an attorney or accountant, and signed by a judge that instructs the pension administrator on how to divide the future payments from a pension. It might specify the survivor beneficiary, for example, and the percent of future payments that each spouse will receive. In the “immediate offset” method, a pension participant compensates the spouse for his or her portion of the value of the future pension payments at the time of the divorce. This requires calculating a present value of the pension, as described in the next section. It is also possible to divide the value of a defined benefit plan, or pension, in the present, without waiting for retirement. In this case, the pension participant keeps all future benefit payments from the pension by “buying out” the spouse at the time of divorce. To do this, one must calculate a “present value” of the pension, which requires complicated calculations. This is typically done by a pension valuator or actuary (currently costing about $175 in Western Massachusetts). You can also use this low-cost, $35 present value pension calculator. Once a present value is determined, a spouse can “buy out” the other spouse from the pension. This means that the spouse with the pension can keep all the future benefits of the pension, but must come up with a large amount of money at the time of divorce to compensate the other spouse. If a person has worked 10-15 or more years in a job with a pension, the present value of the pension can be surprisingly high. For some couples, finding the present value of a pension is helpful if one spouse wants to keep the house, and the other spouse wants to keep his/her pension. If the house has equity of $200,000, the staying-in-the-house-spouse would need to pay the other spouse $100,000 to divide the asset evenly, but many people do not have $100,000 in a bank account to make such a buyout. If the spouse-who-is-leaving-the-house has a defined benefit pension, however, the couple can have a present value of that pension calculated for them. If the present value of that pension is around $200,000, the spouses can divide the assets evenly without any cash changing hands. There are two common, legal methods for valuing and dividing future pension benefits in Massachusetts: 1) the “accrued” (or “bright line”) method, and 2) the “relative-time” (or “projected” or “coverture”) method. Either can be used in Massachusetts. 1) The “accrued” (“bright line”) method focuses only on the marital years. If these marital years are during the early years of pension plan participation, this results in less of the eventual pension being shared with the alternate payee, the ex-spouse. This is because pension benefits are nearly always based on formulas that disproportionately value the final years of plan participation. Most states do not allow this method of dividing a pension, but Massachusetts does.